Paul A. Straub founded his company in the year 1915 and at first concentrated on importing items manufactured at the Gräflich Thun'sche Porzellanfabrik Klösterle (in English often simply named 'Count Thun factory') from the town of Klösterle in the Austrian part of Bohemia (today Klášterec, Czech Republic). 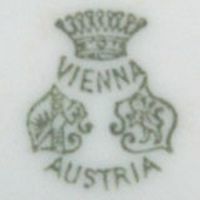 All of these items were from one large item family supposed to be like the porcelain originally produced at the former Royal Porcelain Factory in Vienna and the mark used on these items was actually a dedicated export mark owned by the Gräflich Thun'sche Porzellanfabrik Klösterle and had previously been used on items handled by three New York importers: PH Leonard had been the first until his bankruptcy in 1898. He was succeeded by Bawo & Dotter who took his place for a short time before being replaced by Charles L. Dwenger, followed by Straub around 1915. Logically nobody can nowadays say who actually imported specific items based on the mark alone. Straub also had German contacts, including the factory in Tirschenreuth and that of Lorenz Hutschenreuther from the city of Selb. 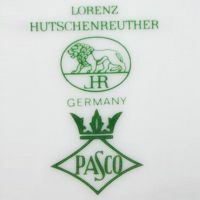 Next to the non-exclusive Hutschenreuther forms #970 (PASCO 'BLENHEIM') and #7658 (PASCO 'THE RICHELIEU'), Straub also was sole US distributor of Hutschenreuther's own 'NOVUM 65' series, which was offered as plain white ('NOVUM 65'), with an abstract blue border ('NOVUM 65 BLAU') or with a stylized blue flower ('NOVUM 65 BLAUE BLUME'). In the UK, that right had been acquired by the company of Charles F. Bristol & Son which - on a very small scale - exported various items to the US. Protecting his rights as US distributor, Straub therefore filed a registration for the 'NOVUM 65' word mark on October 8th 1965; it was officially registered in the US on July 12th 1966 under registration №·0811013. In 1970 however the Straub business was sold to HMW Industries (from Stamford/Connecticut) which continued to import Hutschenreuther items through a subsidiary, Wallace Silversmiths. The 'NOVUM 65' trademark remained untouched by this and the US registration finally expired on January 14th 1989. Importer mark used from around 1885 by Leonard, then Bawo & Dotter followed by Charles L. Dwenger and finally Paul A. Straub. 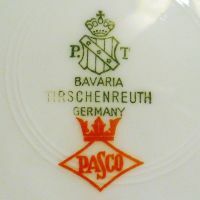 'PASCO' mark addition on Tirschenreuth product (dated 1938-1969 per mark version). 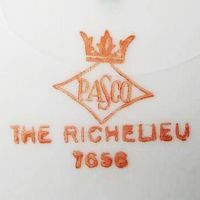 'PASCO' mark on 'THE RICHELIEU' series produced by Hutschenreuther. 'PASCO' mark addition on Hutschenreuther product (dated 1968-1970 per mark version).